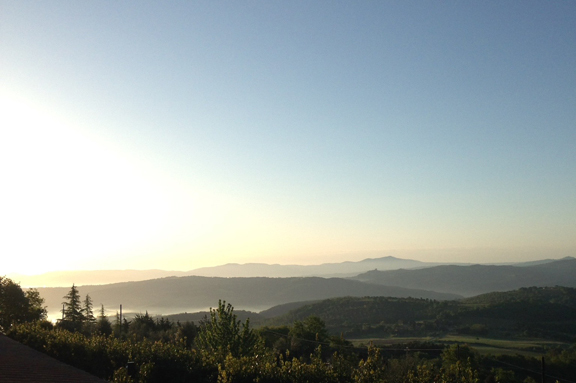 Above: Dawn in Montalcino (photo taken in early May, 2015). Origins: Montalcino up to the year 1000 C.E. The significant amount of stone-age arms and tools found in the Montalcino countryside, which can be dates to 30,000 B.C.E., is evidence that the area was amply populated as early as prehistoric times. Although we have no written documents from the Etruscan and Roman periods, numerous artifacts and settlements from that era have been unearthed within the confines of Montalcino township. Etruscan place names (like Rasa and Velona) as well as Roman place names (like Argiano, Bolsignano, and Camigliano) also offer evidence of those peoples. The most important prehistoric archeological finds from those periods are preserved in the Musei Riuniti Civico Diocesano (the Municipal and Diocesan Museums) in Montalcino together with a remarkable collection of paintings, statues, and medieval artifacts. The first written document that makes reference to this area is dated 715 B.C.E. It does not, however, mention Montalcino township, which probably did not exist at the time. It is signed by Liutprand King of the Lombards and it describes a dispute between the bishop of Siena and his counterpart in Arezzo over the ownership of certain parishes in what is now Montalcino township. They include Sancti Andreae in Malcenis (possibly Malcena), which is known today as Badia Ardenga (Ardenga Abbey, which lies about 20 minutes north of Montalcino proper by car). In 814, the land that would later become Montalcino township was bequeathed to the monastery of Sant’Antimo (which lies in the southern part of the township) by Emperor Louis the Pious. Despite the fact that there are no written documents to support the claim, some historians believe that the earliest settlement in Montalcino can be dated to the tenth century, a hypothesis embraced by local traditions as well. According to an ancient legend, it was founded by the bishop of the ancient city of Roselle. He had taken refuge in the hills of Montalcino with half of his community as he fled Saracen pirates. The other half founded the settlement at Massa Mirittima, along the Tuscan coast. Other historians believe that the city was built by the monks at Sant’Antimo, who had built a dwelling in Montalcino’s Barlanzone hamlet around the year 1000. It’s probably that there’s some truth to both of these versions of the Montalcino origin story.